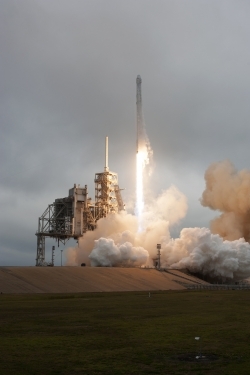 A problem with the GPS system occurred on 22 February, three days into the mission, when the SpaceX supply ship Dragon was less than a mile from the ISS. The approach was aborted, although NASA has since confirmed that neither the station nor its six-person crew were in any danger. Another attempt is to be made on Thursday, 23 February. This is the first time SpaceX has had to abort a mission at this late stage. It occurred just hours after Russia successfully launched an ISS-bound cargo ship from Kazakhstan, the first since a failed launch in December. Dragon took off from Launch Complex 39A at NASA’s Kennedy Space Center in Florida on 19 February. It was the first commercial launch from the historic pad. One of the most important pieces of equipment being transported by Dragon is SAGE III (Strategic Aerosol and Gas Experiment). Part of one of NASA’s longest-running Earth observation programmes, it will examine the levels of ozone, aerosols, nitrogen dioxide and water vapour in the stratosphere and troposphere high above Earth. The instrument, which weighs one tonne, will be connected to the outside of the station to make daily observations over several years. Among the materials carried on board Dragon is a crystal growth experiment that will crystallise a monoclonal antibody that is undergoing clinical trials for the treatment of immunological diseases. Growing the crystal in space will allow it to develop better than it would on Earth, where gravity causes crystals to collapse on themselves, NASA says. Also on the flight are supplies that will enable further study of stem cells such as those used to treat strokes and other medical conditions. The mission is SpaceX’s 10th cargo flight to the ISS under NASA’s commercial resupply services contract. Dragon’s cargo will support dozens of the more than 250 science and research investigations scheduled for the station’s Expeditions 50 and 51.